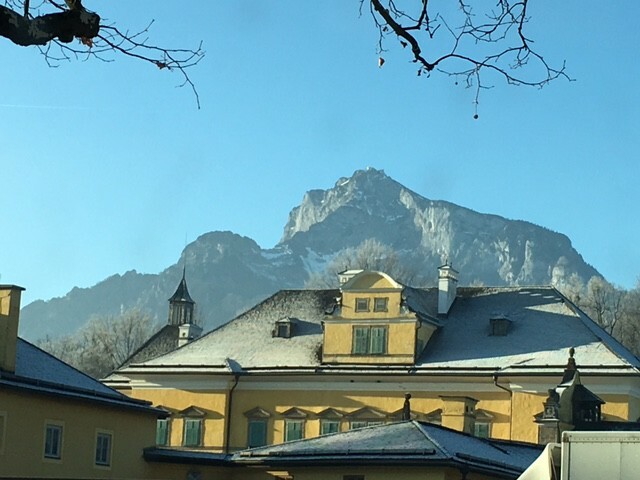 The Untersberg Mountain and Charles the 5th. The Untersberg Mountain is one of the most important mountain, surrounding the city of Salzburg. In the following you will read another legend about a famous emperor connected with this mountain. Inside the mountain should the Emperor Charles V reside and sleep as long until his beard has grown 3 times around the table. Twice it is already around the table and it is carried out for the third time, then the Emperor will awake out of his sleep and the last day is dawning. If 24 Ravens fly 3times around the mountain, they will also wake up the Emperor, but then he has to stay in the mountains as long as the famous dwarf stone is found. This stone will transform all dwarves that inhabit the Untersberg into normal people. Then also the Emperor returns back to the living. If someone is successful to steal the golden scepter, that the emperor holds in his hand, and then lead 3 tricks against the Unterberg the emperor would also be released. He would then come out with his army from the Unterberg and will begin a general world war. This will be the beginning of the last day. 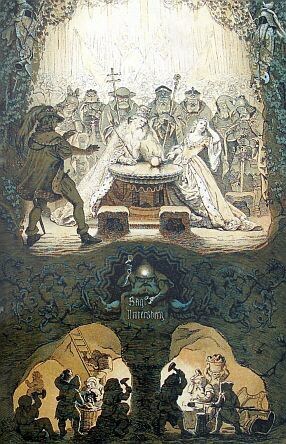 At each birthday celebration of the Emperor a solemn procession of dwarfs is held at the Unterberg mountain. The person that is during this procession on the mountain is definitely not the lucky one; he would be irretrievably lost, because the dwarves love to be left alone. In the mountain there are many caves. Whoever finds the right, can deeply go into the mountain through the cave. And if he is lucky, he can see the old Emperor, as he sits with his men at the table there, eating and drinking and waiting until his time comes to return, when he takes off, gets out of the mountain at the top of the good to destroy the evil. But the one who finds him must not give a sound, otherwise he has to stay in the mountain with the Emperor and wait and wait. But if he comes happily out of the Unterberg, then the color of his hair changes into gray. At some men this has already happened. In the mirale mountain sits besides other royals and noble lords Emperor Charles, with a golden crown on his head and his scepter in his hand. On the large Walserfeld (a large field between the city Salzburg and the mountain in the village Wals) he was delighted and has maintained his original form, as he had it on the temporal world. His beard has grown gray, long and covered him the golden chest piece of his clothes entirely. At honored days his beard is divided into 2 parts, one is on the right side, the other wound on the left, with a precious pearl ribbon. The Emperor has a sharp and profound face, and he shows amicably and collectively against all subordinates that go with him in a beautiful meadow back and forth. Why he is staying there and what his job is, no one knows, and is among the mysteries of God.